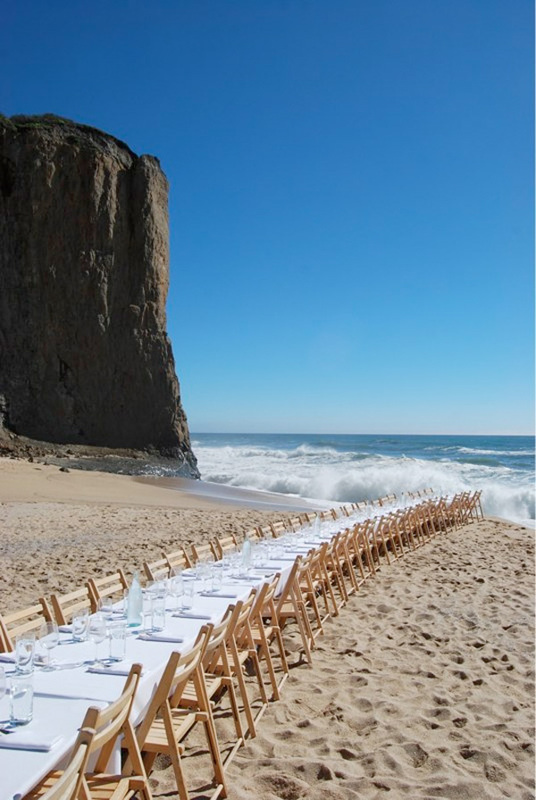 This could easily be a post about amazing photographs of seemingly endless dinner tables trailing off into breathtakingly magnificent landscapes… in fact, i have a hard time just getting past the images you’ll see on the next page enough to tell you why, beyond the table imagery, Outstanding In The Field is SO spectacular! (Quick side note: How fun is their LOGO?) 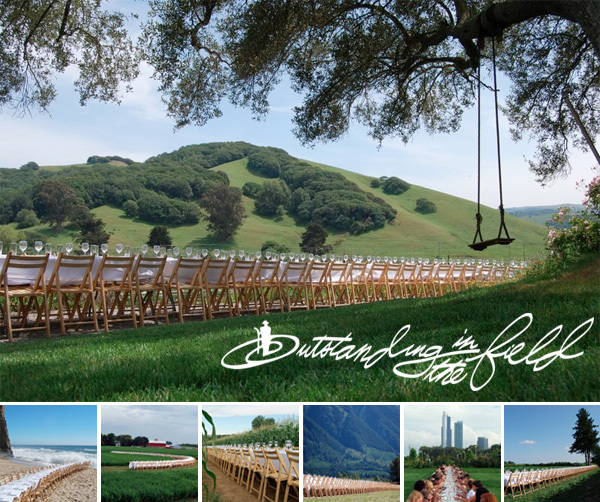 The main image above is at County Line Harvest, Petaluma, CA ~ the swing just makes me smile. Ok, but moving beyond the beautiful images of endless tables… (You can see plenty more of that on the next page too!) A friend of mine was telling me about these a few months back, but i had forgotten the name, and just discovered the website tonight! 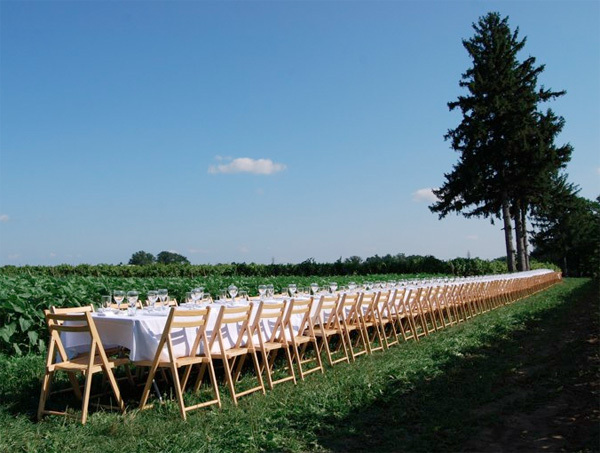 Outstanding In The Field hosts incredible farm dinners, bringing together farmers, celebrated chefs, and eager diners alike. From humble beginnings of “farmers dinners” in Santa Cruz hosted by chef and artist (whose work you definitely know if you’re reading this! ), Jim Denevan in the summer of 1998… which coupled with his brother, Bill, a “pioneering organic grower in California was one of those farmers that brought his ingredients and his story to the restaurant.”… evolved into dinners on the farm! 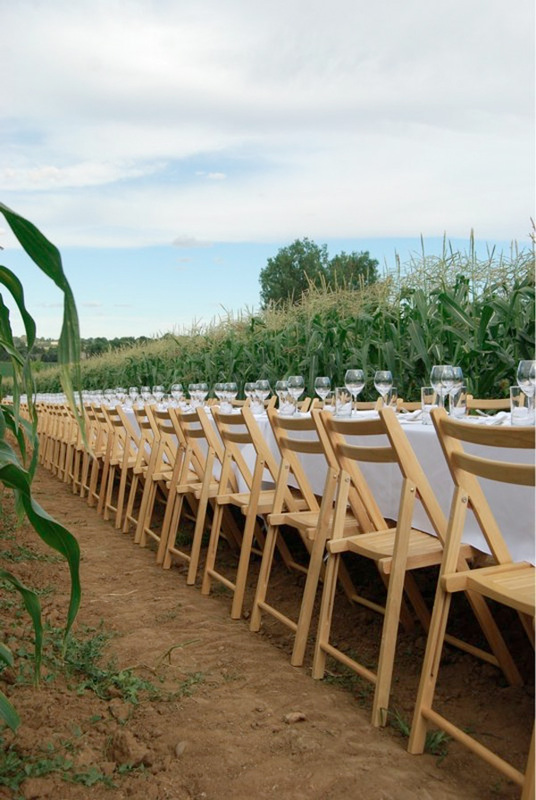 Now, over a decade later it has grown into a series of traveling around the world hosting Farm Dinner events as well as private events. Are you hooked yet? I’m seriously bummed right now that the remaining Los Angeles dinners are sold out already… perhaps we will need to think about a NOTCOT private dinner? Let’s discuss that more in the comments though… for now ~ go fall in love with the images on the next page! From the Outstanding In The Field About>History Page ~ the story is so inspiring, i’ve copied it below so i never lose it! It all started in the summer of 1998 with a series of “farmer dinners” at Gabriella Cafe in Santa Cruz, California. The founder of Outstanding in the Field, chef and artist Jim Denevan, invited several of the restaurant’s regular producers out of the field and into the restaurant; the night’s menu would feature dishes where the ingredients came straight from the farm and the girl or guy that grew the food or raised the animals or caught the fish would join everyone for the meal. When the first farmer stood and addressed the hungry diners with “this came from my farm” it was clear, people wanted to hear from and appreciate farmers. Jim’s older brother Bill Denevan, a pioneering organic grower in California was one of those farmers that brought his ingredients and his story into the restaurant. Bill’s productive orchards in the scenic Santa Cruz mountains are planted among groves of tall redwoods. From experience working and staying on Bill’s farm as a teen Jim knew there was an even better place to celebrate the farmer… right on the farm! With this idea in mind in August of 1999 farmers were contacted, a schedule was developed and fingers were crossed. Would anybody come to this thing? 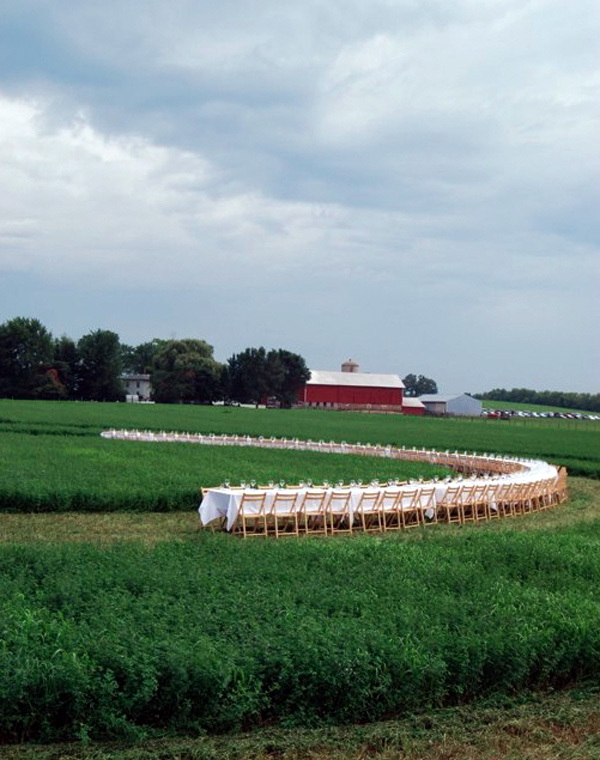 The word went out and guests did arrive, enough to fill a long farm table. In a tradition that continues, people came toting there own plates showing myriad colors and style, brought from home, each diner contributing to the unique table composition. After a welcome greeting guests were shown around by farmer Andrew Griffin, the farm tour ending at a table set among flowering irises and ripe tomatoes. 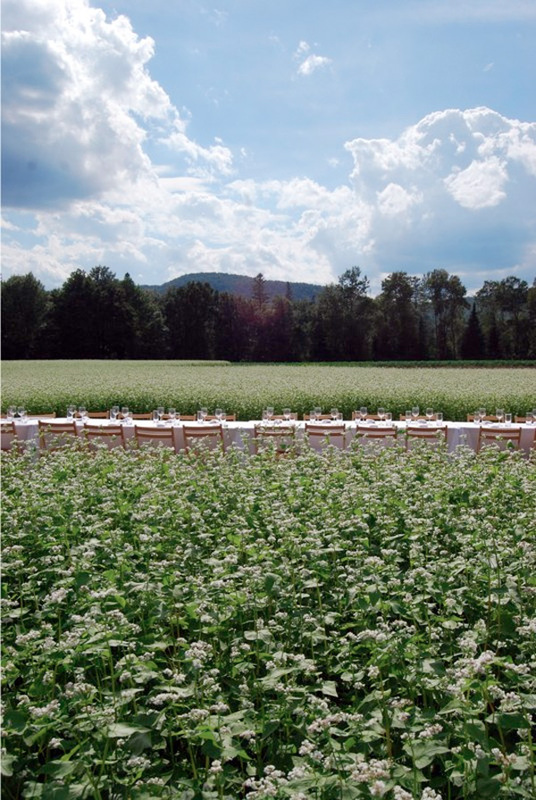 On a warm late summer afternoon Outstanding in the Field founder Jim Denevan and chef friend Tom King prepared a 5 course meal with ingredients right from the field. 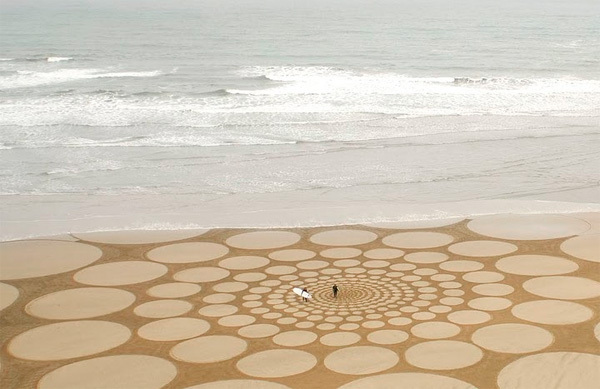 After a few seasons on the farm Jim decided to expand the idea to farther fields. Guest chefs were recruited from around the greater San Francisco Bay Area and a detailed schedule was released with events taking place from late summer into fall. 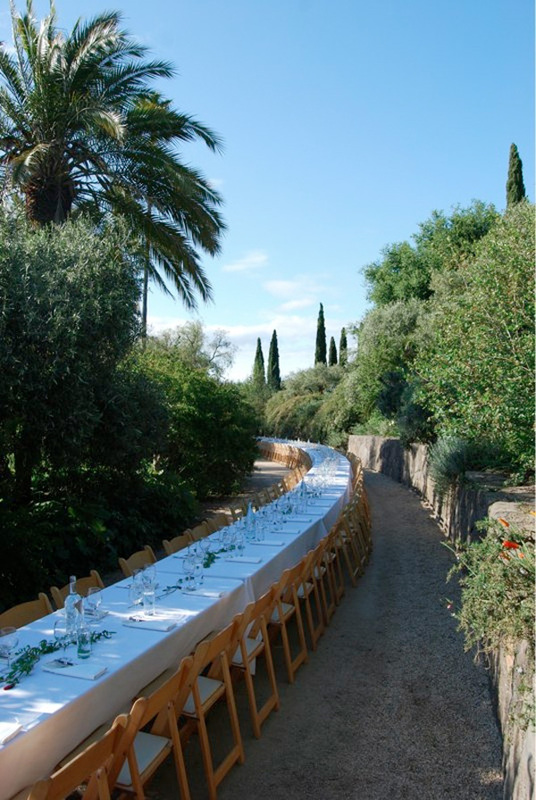 Participating chefs and farmers collaborated on open air feasts at several ranches, vineyards and orchards. Notable chefs like David Kinch of Manresa, Traci des Jardins of Jardiniere, Craig Stoll of Delfina and Charles Phan of The Slanted Door joined us in the field. The support grew, guests returning again and again, with colorful plates in tow. 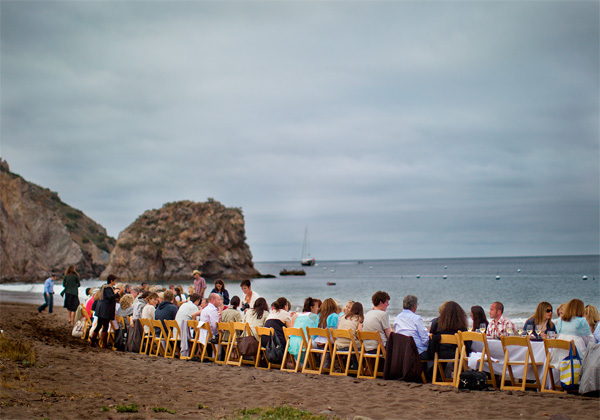 Encouraged, in 2003 Jim organized the first events outside Northern California: an event at Stone Barns Center for Food and Agriculture in New York and at Coleman Family Farm near Santa Barbara. Katy Oursler, who now directs Outstanding in the Field private events joined the farm dinner team in 2003 after experiencing an event under the ripe apples at Bill Denevan’s farm in the Santa Cruz mountains. Katy and Jim hatched ambitious plans to take the farm dinner idea from coast to coast. A beautiful but cantankerous red and white bus was found on the SellaBus.com website and an optimistic crew of Katy, Jim, Natalie Mock and Caleb Coe hit the road. Numerous adventures and misadventures later the crew safely returned home. The OITF team comes from around the world Founder Jim Denevan goes on the road each season. Katy Oursler occasionally joins the road crew but most of her time is devoted to Outstanding in the Field private events. Our core staff is from Chicago, Illinois; Atlanta, Georgia; Burlington, Vermont; Portland, Oregon, Vancouver, Canada and Santa Cruz, California. Other temporary staff has included folks from the Netherlands, Switzerland, Germany and Italy. Farm dinners are happening! Everywhere people are excited to get to know farmers, visit farms and celebrate real food culture. Farmers are even seeing a degree of renown. 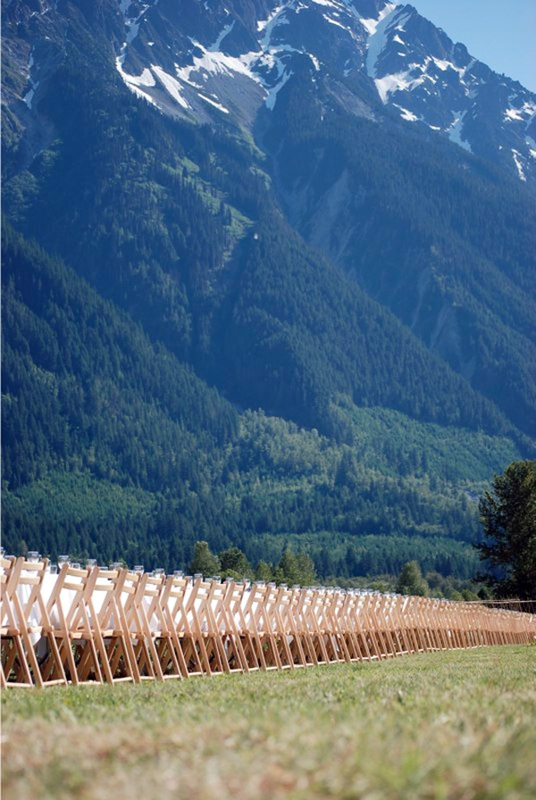 Farmers like Michael Grady-Roberson in New York, Romeo Coleman in Santa Barbara, Bob Munson in Boulder and Jordan Sturdy in Pemberton, British Columbia are celebrated both in their communities and further afield. 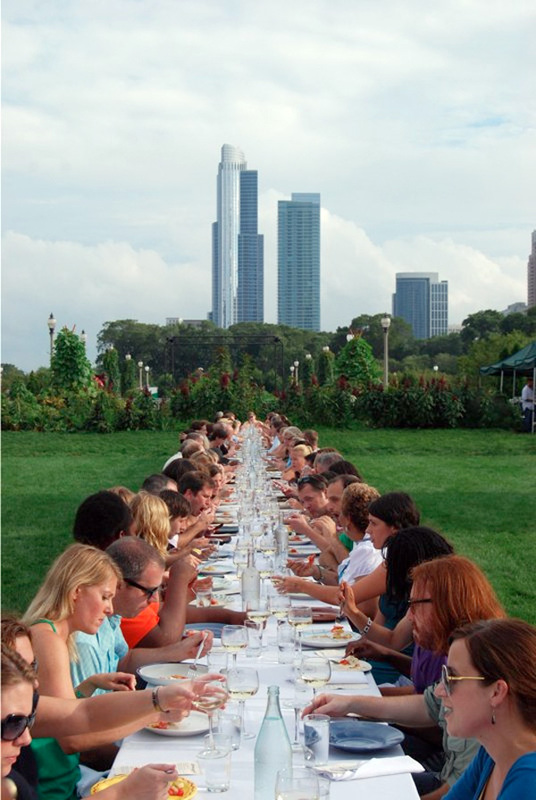 Farm dinners have caught on, we now organize as many as 60 events a year. Celebrated chefs like Dan Barber, Paul Kahan, Frank Stitt, Mourad Lahlou, Gabrielle Hamilton and Scott Peacock have joined us. We have crossed North America six times and gone as far as Alaska and Florence, Italy and in 2010 plan to take our table and chairs to the rest of the world. We spent the giving of Thanks holiday dinner with Terri Collin who has experienced a few of these amazing feast. would be hosting in Northern California. I love all the beautiful pictures but I really want to find out how to be so wonderfully blessed to attend one of the dinners. I belong to a qourmet club that tries to do something similar to your dinners by trying to support local suppliers. Please let me know the when and where’s on how to attend. Thanks! I have a recommendation for a chef to Co-Host a dinner near Anniston, Alabama. He is currently the Executive Chef of the Anniston Country Club, a graduate of the CIA, Alumni 1992. This Chef has incredible talent that deserves recognition. I feel that bringing Andrew Smith and Outstanding in the Field together with a local farmer would create a needed sense of community and down to earth ideas of eating locally. There are a many farms in our area with locally grown produce and animals which also deserve recognition. With a little research on both our parts I believe we could produce an event with spectacular results. Some really beautiful shots in here, especially of my hometown Chi-Town! But the idea of ourdoor tables for outdoor wedding receptions is definitely giving me ideas of what I want to do for my own wedding. Thanks! WOW… I love this. I especially love the shot of chicago in the background. it reminds me I am human. Its amazing!!! and he was commissioned by the Anthropologist (a new inspiration based site by Anthropologie) to do an major work in Siberia. Check it out!! (http://www.theanthropologist.net/#/JimDenevan/). He’ll be creating a master piece this evening at Fashions Night Out in New York outside the Anthropologie store at Chelsea Markets (9th and 15th).